In search of a powerful Business Consulting WordPress Theme to take your website to the next level? Unixco is the one. It is carefully crafted to assist you in presenting your business research services impressively as well as building functional and beautiful website effortlessly. Purposeful design is geared to show how professional and beneficial your business analysis services are to customers. Unixco comes in with 04+ Modern Homepages with well-designed sections to highlight your expertise. You are equipped to easily list practice areas, case studies, show portfolio, successful projects, testimonials, team members, missions and values, etc. Plus, a myriad of handy elements, templates, and inner pages are pre-made for you to make use of. Exciting effects and animation are packed block by block and page by page. Unixco is tailored to be as detailed as possible for you to use right away! As for customizing and building web pages, you can utilize an amazing Page Builder – Elementor. This resourceful tool enables you to build pages fast and easily with intuitive interface and great visual display. The cool part is Real-time customizer! You can customize block ‘s layout, color, typography, margins, padding and see changes instantly! With a huge library of widgets available, you are well supported to illustrate your business research services in the best way. All you have to do is Drag and Drop widgets. Also, you will find it easy to install and import demos with One-click Import tool. Unixco is a hassle-free tool for you to launch your site with zero coding required. You don’t need to be a tech-savvy to make it! 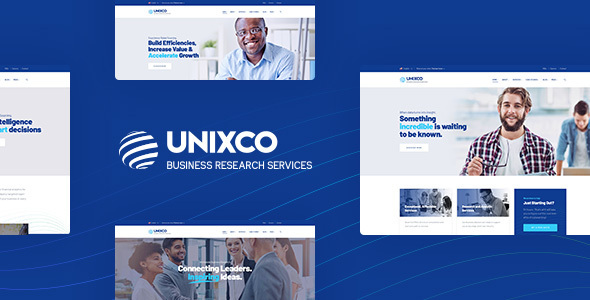 For a responsive, fast-loading, SEO-friendly Business Consulting WordPress Theme, Unixco is your solid choice. Ce contenu a été publié dans business, corporate, wordpress par ntsi, et marqué avec accountant, business, coach, company, consulting, corporate, elementor, finance, financial, insurance, market, professional, stocks, trade. Mettez-le en favori avec son permalien. © 2004 - 2018 | Groupe NTSi - Informatique (SARL) et ses filiales. | Site Web et Design intégralement réalisé par NTSi. | Tous Droits Réservés.